Cinnamon & Nutmeg, the Cubalaya enforcers. They make sure everyone knows their place, in no uncertain terms. These girls are on the pension plan, and won't be eaten. They're from our first hand-raised bunch. Red, the Ameraucana Pirate Chicken. You can put her on your shoulder and she'll perch there. She lets me snuggle her. The Black Jersey Giants, Molly and Lolly. They're the first to greet me at the car or when I go outside, because they know the hairless monkey often brings food. They also talk to me alot. They don't let me snuggle them. "Chicken says 'NO'." Cagney & Lacey, the Japanese Golden Phoenix girls and excellent mommas. Lucky, the White Leghorn rooster. He's very respectful of the hairless monkeys, and treats the ladies well. 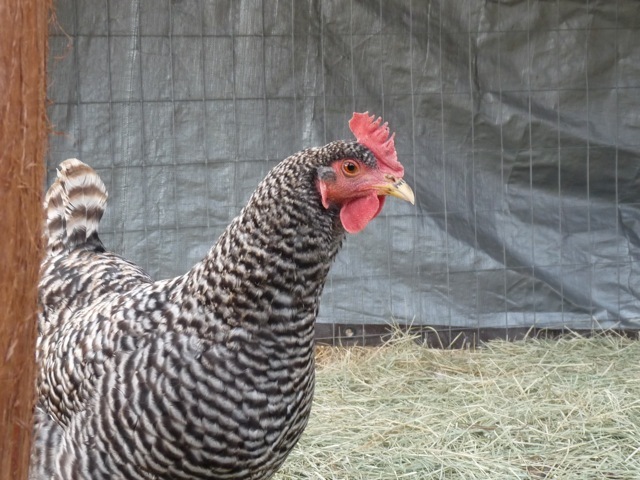 These chickens are also on the pension plan, either due to personality or skills. The other hens are a variety of breeds - Sicilian Buttercup, Egyptian Fayoumi, Welsummers, Buff Orpingtons, and more Ameraucana & Barred Plymouth Rocks. They may or may not eventually meet the stock pot. It's a sad reality, but egg production tends to drop sharply after a few years, and organic feed ain't cheap. We try to give them a good life here, however, with free access throughout the property during the day, and all the bugs, grubs and grasses they can eat (as well as that aforementioned organic feed). They'll definitely be an integral part of keeping the bug population controllable once the orchard matures. In the meantime, we sell the hen's eggs to the local co-op, and that helps offset their feed costs. We also don't use timed lights in the overnight coop to encourage more egg-laying during the winter months - letting their bodies have a break helps their long-term health and long-term egg-laying abilities.